QUEENSLAND veterans and their families will enjoy free travel on public transport on Remembrance Day after an "inconsistency" was corrected by the State Government. Every year on ANZAC Day, eligible passengers have been able to access free travel. However, that has not been the case for Remembrance Day. But Transport and Main Roads Minister Mark Bailey said his office had fixed the error in time for the 100th anniversary of the Armistice. "Every year, veterans and their families attending ANZAC Day events travel on public transport for free, but that policy did not cover Remembrance Day," Mr Bailey said. "This inconsistency was recently pointed out to me, so this week I asked my department to change their policy." Mr Bailey made the announcement while attending the unveiling of a commemorative 'Troop Train' - which will feature a specially designed wrap featuring the distinctive lone soldier and red poppy - at Roma Street Station. 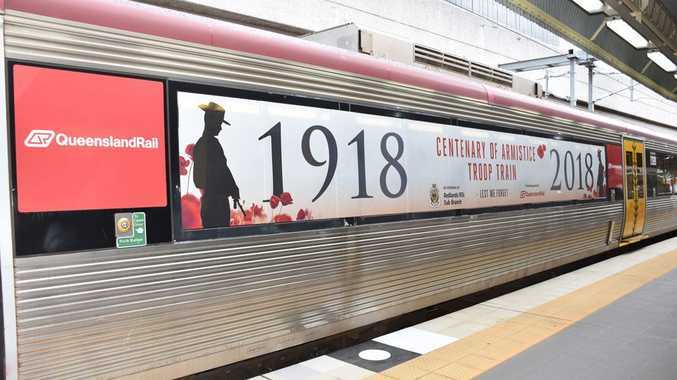 "The 'Troop Train' will travel on the Queensland Rail network in the lead up to Remembrance Day to remind people of the sacrifice our servicemen and women have made, and continue to make each day," Assistant Minister for Veterans' Affairs Jen Howard said. Uniformed serving Australian Defence Force personnel and veterans wearing their service medals will enjoy free public transport access to and from services on TransLink bus, train, ferry and tram services (except the Airtrain). Accompanying family members wearing service medals also travel free. For more information on public transport, visit the TransLink website translink.com.au or phone 13 12 30, anytime.